Anthony Mordechai Tzvi Russell performs with accordionist Dmitri Gaskin as part of the duo Tsvey Brider (Two Brothers). on Saturday, Feb. 2, at Congregation Beth Elohim. He could have been a god or the devil, a king or an assassin. Playing one of them onstage, that is, had Anthony Russell continued his career as an operatic bass. 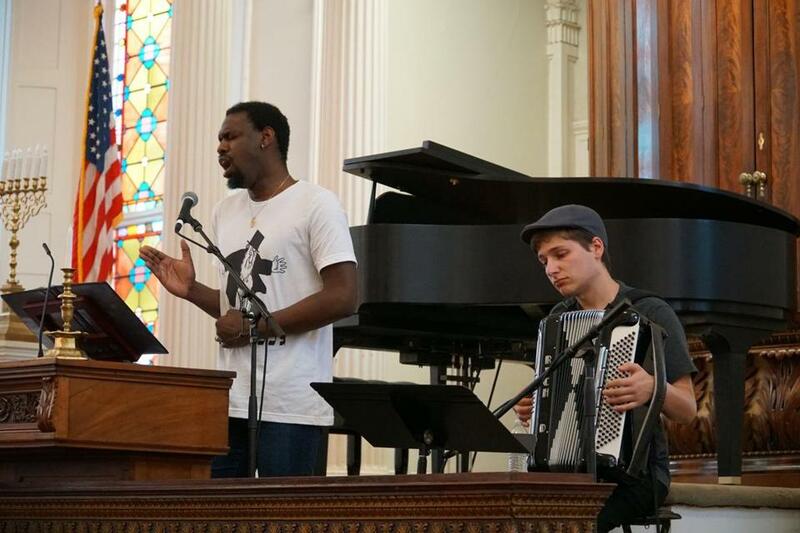 But instead, this Navy brat raised in a Christian African-American family found his calling in Yiddish music, a soulful mix of folk, art song, and liturgical works that arose among the Ashkenazi Jews of Eastern Europe in the 19th century. “You never really know out in the world where you’re going to find parts of yourself,” said Russell. Anthony Mordechai Tzvi Russell, who has appeared nationwide and overseas in such far-flung cities as Berlin, Krakow, and Tel Aviv, will give a concert Saturday, Feb. 2, at Congregation Beth Elohim, the Acton synagogue where his husband, Michael Rothbaum, became rabbi in June 2017. Russell will perform as part of the duo Tsvey Brider (Two Brothers) with Dmitri Gaskin, a California-based accordionist and pianist. They compose music to accompany Yiddish poetry, much of it written in the last century. Russell introduces each song with an English translation. The pair formally teamed up after winning the 2017 Der Yidisher Idol competition, held annually in Mexico City. Russell and Gaskin have embraced the challenge of making Yiddish song vibrant for today’s audience. While their compositions have echoes of the past, they are infused with modern influences. “In one piece you’re as likely to hear elements of blues as you are of traditional Ashkenazi Jewish accordion music,” Russell said. Also on the program will be songs from Russell’s Convergence project (available as an EP), which combines Yiddish songs with African-American spirituals. For example, he intertwines Avrom Reyzen’s “Der Gemore Nign” (“The Talmud Melody”), about a yeshiva student far from home, with “Sometimes I Feel Like a Motherless Child.” Both are in a minor key, based on a five-note scale, and share themes of loneliness and loss. Russell, 37, who was born in Texas, moved around the country with his family before settling in the San Francisco area. For much of his youth, he was home-schooled by his mother, a classically trained pianist. In fact, the singer was Sidor Belarsky, who like Russell had started out in opera before emigrating from Russia to the United States in 1931 and spurring a revival of Yiddish music. He scoured Belarsky’s compilation of 70 Yiddish art songs. As he dug deeper into the genre, he was astounded by its many incarnations, including in the Yiddish theater of early 20th-century Europe and New York City; and as pop music standards such as “Bei Mir Bist Du Shein” (“To Me You Are Beautiful”), recorded by among others the Andrews Sisters, Ella Fitzgerald, and Tommy Dorsey. Yiddish itself appealed to Russell because it’s a diasporic language. “As an African-American, I’m already in a diaspora,” he said. Gaskin noted that Yiddish — a European stew of primarily German and Hebrew — is particularly suited for chanson settings because many of its words flow from one to the other, as in French. Russell’s race is unusual in the Yiddish song world, but he’s emphatic about not being defined by the color of his skin. “It shouldn’t be any more curious that I found meaning and self-expression in Yiddish song than that, say, a Jewish person in the 1950s on the Lower East Side suddenly decided he’s interested in jazz or blues or Motown,” he said. The Feb. 2 concert will be held at 7 p.m. at Congregation Beth Elohim, 133 Prospect St., Acton. For tickets, visit bethelohim.org/event/tsveybrider. For more on Anthony Russell, visit www.anthonyrussellbass.com.